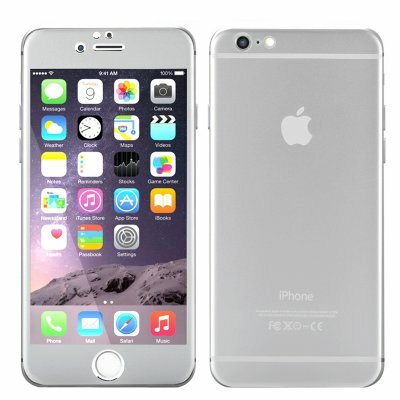 Successfully Added iPhone 6, 4.7 Inch Protective Cover - Alloy Titanium Back, Tempered Glass Front, 9H Rating, Scratchproof, Shatterproof (Silver) to your Shopping Cart. Did you know that the cost of repairing an iPhone 6 screen at the official centre costs over $109? With this full cover set for iPhone 6 devices, you can be safe rather than sorry and keep you beautiful 4.7 inch Retina display well-protected for a fraction of the price. Designed specifically with the iPhone 6 in mind, the screen protector will sit perfectly on your phone, preserving and enhancing the beauty of the original design. The back cover is made of lightweight, flexible, yet sturdy titanium alloy, shielding your phone from unintended damage. The front cover is a tempered glass screen protector with 9H hardness rating. In addition to protecting your phone’s display from scratches and smudges, tempered glass is shatterproof. This means that should the worst happen and damage become inevitable, the screen protector won’t break into pieces, but stay in place absorbing most impact from the fall. Applying the tempered glass protector is easy. Just gently wipe down your screen, removing all dust and dirt particles, peel back the protective film from the cover and carefully place the screen protector onto the phone’s display. This product is in stock now, we offer a 12 months warranty on all our products. Brought to you by the leader in electronic devices as well as protective phone covers, Chinavasion..